One of the fundamental values of the Khalsa Academies Trust and its schools is Seva or Community Service. Last year the Trust started working with the Education Development Trust (EDT) which runs free schools in the UK but also operates in Kenya. Education Development Trust is helping to transform the lives of some 124,000 girls in Kenya by ensuring not only that they are able to go to school, but also that they can then stay in school and that they receive a good quality education while they are there. Khalsa Academies Trust is supporting this initiative by providng educational leadership as well as supporting opportunities for Seva for some of the poorest families in Kenya. 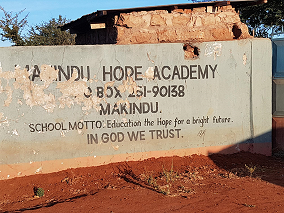 Our first project is Project Hope Academy, a small school located near Makindu, a town 100 miles east of Nairobi where the famous Sikh Gurdwara was established in 1926. Project Hope Academy is about improving the poor school environment as well as educational attainment of 98 pupils aged 4-14, the majority of whom are orphans. Approximately 60 of the students board at the school. The school is a private school and receives very little support from the Government and largely dependant on donations. The school needs desperate help with basic educational resources such as books, tables and chairs as well as replacement of poor boarding resources such as mattresses and sanitation and the supply of sustainable water from a new borehole.